Acumen Athletics: Neck Bridge w/ Halo. Exercise for Muay Thai. Neck Bridge w/ Halo. Exercise for Muay Thai. Neck stability can make a difference between walking through an opponent's hard shot or their hard shot knocking you out. Get use to bridging first. Don't go heavy or high reps.
You're training stability not power or endurance. 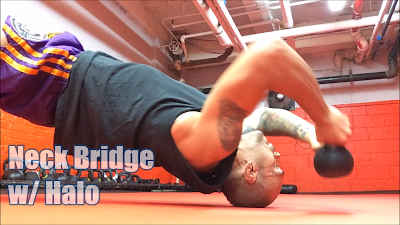 Give this exercise a try and leave me a comment or message with your experience.